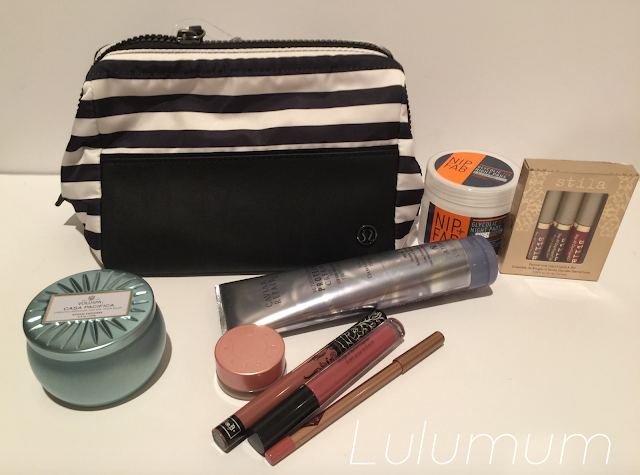 It’s been a bit slow for Lululemon product release so I thought I’d show you some of my favourite giftable beauty products this fall and winter and maybe give you some gift inspiration…. or personal treats for yourself during a stressful season. The Mind & Body Kit is definitely a requirement if you haven’t already tried one out in years past. I’ve poo-pooed it before as an overpriced cosmetics kit but it’s actually extremely well thought out and made for the price point and I love mine. It opens up very wide and stays open and has structure to it thanks to an inner metal frame, it has dividers and inserts and tons of space. I’ve travelled with mine a lot and since I’m traveling again this winter I decided to get a second ‘home’ one so my other one can be my travel one. And I got another one to gift for a makeup lover on my list which I plan on filling with deluxe sample sized products I’ve gotten from my Ipsy subscription. 1. Repair RX Protein Cream I sampled this protein repair cream from Nordstrom a little while ago because although my hair is overall very healthy, I have some chunks of hair around my face that have been damaged by heat styling so I decided to test it out and see if it would be worth purchasing a full size. I hate to buy such a big product tube when I have just a few areas of damage but after testing it out I had to run out and buy the full size. My hair texture is completely changed by this after two weeks of use. The damage is gone but more importantly, my hair is silky and smooth and the frizz I get from my fine/textured hair is gone. I feel like I’ve had one of those expensive salon straightening treatments. Definitely see if you can get a sample of this at Nordstrom or at Sephora and see if it works miracles for your hair type. I don’t know what this does for different hair types but I know for mine it immediately became holy grail status. 2. Stila Stay All Day Lipstick in Patina & Kat Von D Everlasting Lipstick in Bow And Arrow Liquid lipsticks….how did I not know about you before??? I found the little Stila mini trio kit at Shoppers Drug Mart and loved all of the colors so decided to pick it up and test it out at home. This stuff is what you need if you want that matte, high pigment Kyle Jenner lip look. It lasts at least 6 hours for me and doesn’t rub off which is what made me utterly obsessed with them. I have since purchased a full size Stila in Patina and the Kat Von D in Bow And Arrow and I’m not sure which I love more. I think it’s a tie between Bow and Arrow and the light color Bacci in the trio. 3. Charlotte Tilbury Lip Cheat in Pillow Talk, in my discovery of liquid lipsticks I learned that I need a more defined lip but I really hate that drawn on lip line look. Somebody recommended this one to me and I really like it, even on it’s own without lipstick. It’s a my lip color but better shade and it goes on very smooth. I also really liked that I could order off the CT website in Canadian dollars, get free shipping and my product arrived in 3 days. 4. Becca Undereye Brightening Corrector. I hate wearing full makeup but the dark circles under my eyes dictates that I should try something to look alive. I like the salmon coloured sheer concealers under my eyes and this stuff also has some illuminating shimmer and a thick (yet sheer) and sticky formula that allows you to layer concealer over it without spreading it around. Don’t put too much of this stuff on or you will look like a racoon like I did under fluorescent lights. Dab a little tiny bit on under your eyes and you are good to go. Bright eyed but still with a bad attitude. 5. Nip Fab Glycol Pads Nip Fab is a product line made by Rodan which is a well known (very pricy) UK brand. Nip Fab is drug store pricing though and really great ingredients. I picked up these glycol pads for $10 at Shoppers Drug Mart. I’m too cheap to buy the various sephora brands that cost upward of $100 but my skin really likes glycolic and lactic acids so I was very happy to see these at the drug store. I’ve gone through the entire container this month and will definitely be buying it again. Glycolic pads are so great for exfoliating and deep cleaning your face. 6. Voluspa Vermeil Casa Pacifica Candle. I really like candles on my desk space and on my night stand so I occasionally splurge and buy these really nice Voluspa candles in the tiny $9 tins. I think they are so great as a gift or stocking stuffer though because they are a really luxurious treat that doesn’t break the bank. I often buy the little tins at either Chapters Indigo, Nordstrom or Anthropology depending on who has the fragrances I like. Some are just yuck but the ones I love are amazing and have great fragrance payoff. "Cozy Cuddle Up Jacket, Brush Stream White Black Wunder Under Pant III, Nouveau Limits Tank, Salute The Sun Tank, Savasana Socks"
"New In Store: Snowballer Jacket, Cozy Cuddle Up Jacket"
Thanks for some new ideas. I'm totally in a rut with my products.